I had a wonderful opportunity to visit the horses of Cavalia Odysseo during their vacation retreat at a local farm in Burlington where they will rest and relax until the show in Mississauga starts on June 21st. It was lovely to see the horses enjoying the beautiful pasture and sunshine. I was able to speak with a number of the staff including a groom who has been travelling with the show for a few years and Marc-Olivier Leprohon, the show’s Artistic Equestrian Operations Director. I quickly understood that putting on a show with 65 horses and 48 artists is no easy feat. Performers: There are 48 artists who perform with the horses including acrobats, aerialists, riders, dancers and musicians. They hail from 11 countries including the US, Canada, Brazil, France, Guinea, Poland, Russia, Spain, The Ukraine, Japan and Italy. Care takers: An osteopath sees the horses every 6 month and there are 3 vet techs on tour with the group as well as a dedicated farrier to take care of the hooves of each horse. There are 120 staff members who take care of the horses in various ways, including stable hands, grooms, trainers, riders, a veterinarian, as well as the aforementioned vet techs and farrier. They are with the horses from 7am to midnight every day. Cavalia searches the world far and wide for suitable horses that will become part of the team. Spain, Portugal, Mexico, France, Belgium, Canada and the United States are all locations where they have found new recruits. All breeds are welcome, and the current list includes 11: Appaloosa, Arabian, Quarter Horse, Canadian, Canadian Warmblood, Holsteiner, Lusitano, Paint, Percheron/Hanoverian Cross Selle Français and Spanish Purebred. All of the show’s horses are male, including both stallions (in-tact) and geldings (fixed) horses. Mares, or female horses while suitable for this type of show would cause the stallions in particular to be a little wild, after all it’s their natural instinct to breed. As Marc-Olivier so eloquently put it, if mares were involved, it would be a “different kind of show”! While there are 65 horses on the Cavalia team, only 50 or so will actually perform in the show each night. Just like in human team sports, if one of the horses is feeling under the weather or has developed a minor injury that requires rest, another team member will substitute in for the performance. The average age of a Cavalia performance horse is 9 with a range between 6 and 14 years of age. Horses can live into their 20s and some even into their 30s. While the show is running, the horses train, stretch and do cardio every day, just like their human athlete counterparts. The horses travel from city to city on large and luxurious trucks which hold 5 horses each. They stop every 4 hours to feed the horses and make sure they drink plenty of water. If it’s a long drive between performance cities, they stop overnight at a stable to let the horses have a rest before the next leg of the journey. Cavalia is very willing to show everyone how they care for and train the horses so that people know what a fantastic life these horses have. The trainers do not push the horses to do more than they want to. 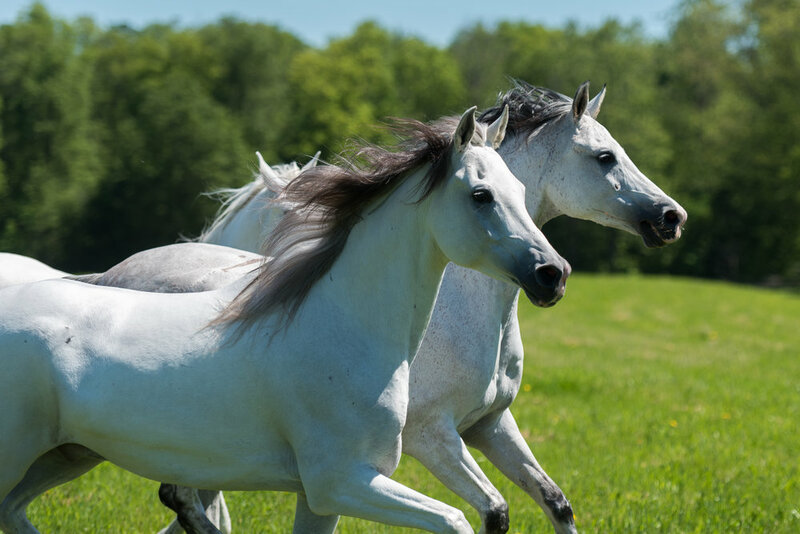 Some horses love and enjoy the work required for performances and these are the horses that become the stars of Cavalia Odysseo. Other horses reveal through the training process that they don’t enjoy doing this kind of work and so they are retired to the Cavalia farm in Sutton, QC where there are currently 30 horses stabled. The horses spend six to eight weeks in each city where they perform and in between performances, they get a vacation for up to two weeks where they rest, relax and spend time outside in the sun and fresh air, grazing on grass. When the horses are ready to retire from the show, they move home to the Cavalia farm in Sutton, QC. Many of the retired horses are still young and go up for adoption. Cavalia is very particular about who the horses are adopted to and what kind of care they will receive. Current horses available for adoption can be found here. Every horse on stage has at least one person that is absolutely in love with that horse. Horses, like people have distinctive personalities and click with people, sometimes as intensely as a best friend relationship. Every horse is so loved and captures a different heart. The behind the scenes chaos before and during the show, could be a show unto itself. There are trainers, acrobats, aerialists, dancers, grooms and horses running around frantically getting ready for the next performance segment, all the while, the spectators only see grace and beauty on the stage. The horses eat a lot! Each horse eats about 20lbs of hay a day, plus three servings of grain. As a team, they go through 15,000 bales of hay and 32,000 kg of grain each year. They are also fed linseed oil to moisturize their skin and manes. Sunday evening the horses receive special treats of carrots and apples. Their manes are braided every night after each show to keep them healthy long and shiny! Cavalia hires local workers from every city they tour in to help out as stable hands; cleaning out stalls, cleaning and refilling water buckets etc. While visiting the horses at their vacation spot in Burlington, I met Megan who joined the troops while she was living in Vancouver. She started off as a groom and fell in love with her work. She has since become a permanent groom, taking care of the Cavalia horses and travelling with them to every location. Check out the careers section here: Cavalia is always looking for young, enthusiastic horse lovers to join the team.